After winning as a freshman and sophomore, the distance standout finished just behind Lewis & Clark’s Katie Thronson in the Class 4A state championships. 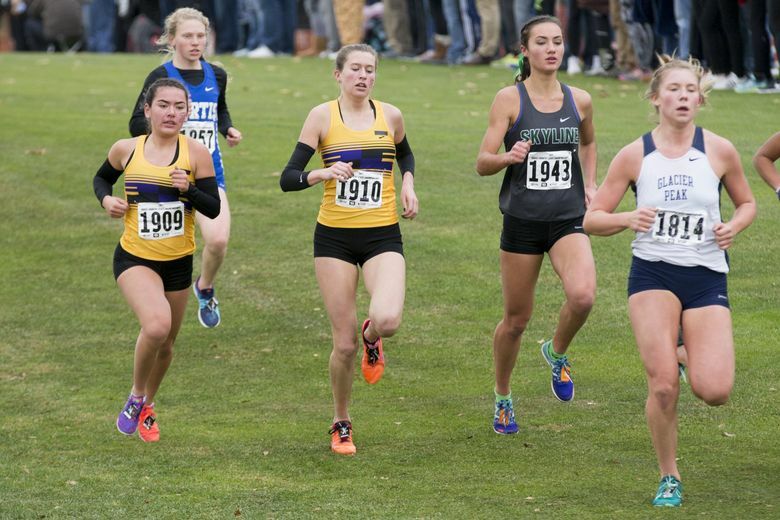 PASCO — Lake Stevens junior Taylor Roe was looking to grab her third consecutive state cross-country championship. Lewis & Clark’s Katie Thronson had other ideas. It turned out to be the top girls race of the day Saturday at the state high-school cross country-championships at Sun Willows Golf Course. Roe had taken the Class 4A title as a freshman for Kamiak, and did the same as a sophomore for Lake Stevens. Thronson, who has run against Roe numerous times, said she usually lets Roe go at the start of the race. This time, Thronson decided to try to stick with her. Thronson decided to break for the lead at about the 2.5-mile mark. Roe couldn’t answer. As the runners came over the final hill to the finish line, many in the crowd screamed when they saw Thronson’s orange-and-black uniform in front. The senior covered the 5 kilometers in 17:35. Roe came in at 17:37.6. Roe said it wasn’t about any pressure of trying to become a three-time state champion. Skyline’s Geneva Schlepp finished fifth, while Issaquah’s Kenna Clawson and Sami Corman finished 8-9, respectively. Issaquah, bidding to repeat as state team champion, finished third behind Lewis & Clark of Spokane and runner-up Camas, which was also second last year. Yukino Parle of Edmonds-Woodway finished second to Erinn Hill of Spokane’s North Central in the Class 3A race. Parle crossed the finish line in 17:59.3, while Hill finished in 17:55.3. Eastside Catholic’s Kate Jendrezek finished third, while Parle’s teammates — Olivia Meader-Yetter and Stephanie Wroblewski — were fourth and fifth, respectively. Interlake’s Ellie Erikson was 10th. Hill’s victory helped North Central take the team title with 42 points, easily beating Parle’s Edmonds-Woodway teammates — who placed second — and their 114. • Nooksack Valley’s Alyce Harlan out kicked Macenna Hansen of The Northwest School over the final mile to win in 18:06.9. Hansen finished in 18:15.1. Northwest, which won the team title last year, was fourth.